How Long Does It Take To Become a Police Officer in Florida? The maintenance of law and order in every soc0iety is a top priority. The responsibility for ensuring law and order falls upon the shoulders of law enforcement officials, including police officers. A police officer is an individual who has gone through extensive training in order to qualify as a sworn defender of the peace. Their job requires them to carry out a large number of duties, all with the principal aim of ensuring that the community is safe, stable and abiding by the laws that govern it. Why Become a Police Officer in Florida? If you’re interested in a career in law enforcement, it is likely that you may be toying with the idea of becoming a police officer. Why should you become a police officer in Florida? The Sunshine State boasts a number of benefits for aspiring police officers. According to data from the U.S. Bureau of Labor Statistics (BLS), Florida is the state with the fourth highest employment levels for police officers after New York, Texas, and California. The state also enjoys good weather year round and has a number of different communities with different employment opportunities and challenges. What Are the Minimum Requirements to Become a Police Officer in Florida? 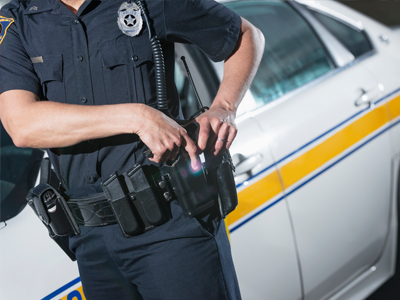 Although the qualification requirements in Florida are similar to those in other states, Florida is stricter in its certification requirements for police officers. Moreover, listed below are the overall state requirements for applying to become a police officer. These requirements may vary at county levels and so, it is important that you check with the police department you intent to apply to. The time that it takes to become a police officer in Florida will necessarily vary from applicant to applicant, depending upon their individual history. Training times may also vary depending upon their individual performance. To get a clearer idea of the time frame you may be looking at, it is advisable that you contact the particular police department you wish to apply to. What Are the Steps to Becoming a Police Officer in Florida? These are all listed above and must be satisfied. New applicants seeking to become officers or individuals who are embarking on a discipline crossovers are required to complete the Basic Abilities Test (BAT) before entering a basic recruit training program. BAT is available in most schools and the results are valid up to 4 years. The next step is to complete the Basic Recruit Program or a Certified Crossover Training Program. Both of these training programs must be completed in a commission certified training school. Applicants can take this test up to three times in order to get a passing score. You must register for this test online at the Florida Department of Law Enforcement website. Once successfully cleared, the applicant is eligible for a “Certificate of Compliance”, which is issued by the Florida Department of Law Enforcement Records Section. BLS data indicates that the rate of employment growth in this field, or job outlook, is 5% between 2012 and 2022. Police officer jobs in Florida, however, are expected to increase at the rate of +9% for the same time period, according to O*NET OnLine. There is always a steady demand for police officers due to the important role they play in society. Police officers are an integral part of any community. They play an important and demanding role when it comes to ensuring the safety and stability of their communities. There are a number of steps, which must be taken if a career in law enforcement is what you are considering. In addition, you must submit to selection tests and extensive training. If becoming a police officer in Florida is your goal, use the information here to help you achieve your career aspirations. Q: According to Florida law, what requirements must all applicants satisfy? Ans:  To become a police officer in Florida, all applicants must be at least 19 years old, have US citizenship, hold a high school diploma or GED, and have a clean criminal record. Applicants will also be asked to give their fingerprints, pass a physical examination, submit to a background check, and prove that they haven’t been dishonorably discharged from the armed forces. Q: What are the benefits of becoming a police officer in Florida? Ans:  According to the US Bureau of Labor Statistics, Florida has the fourth highest employment opportunities for prospective police officers in the country. Working in great weather is an added advantage in being a police officer in Florida.